Sing great Jewish melodies on the bima at Temple family services and get to perform in the annual Purim spiel. Is joining the choir a lifetime commitment? Joining the choir does not require a huge time commitment. 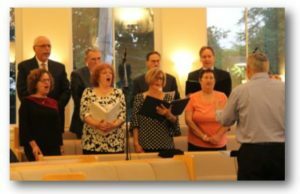 Please know that singing with us does not commit you to be in synagogue at every moment, nor does it require you to be at every rehearsal throughout the year. We all have busy lives, and we will welcome you whenever you’re available. Do I need to be the next winner of American Idol to join the choir? Absolutely not! Come to our choir rehearsal armed with enthusiasm and a pencil. You do not need to be able to read music or Hebrew to participate. Some of our members have years of experience singing in choirs, and for others this is a first. We are friendly and no one is ever left out. If you’ve always secretly wanted to be in a choir, or if you love to sing in the shower, or if you loved the singing of our choir over the years, we’d love for you to join us. If you have any questions, feel free to e-mail CantorNeff@RTRny.org. Do you play an instrument? RTR has two bands: our Chai Life Band that rocks at our Rock Shabbat’s and our Klezmer Band that makes our Family Service Onegs lively. Whatever style you like to play – we could use you. Let us know if you’re interested in joining. Most rehearsals are once a week for several weeks leading up to the performance. If interested, email CantorNeff@RTRny.org.